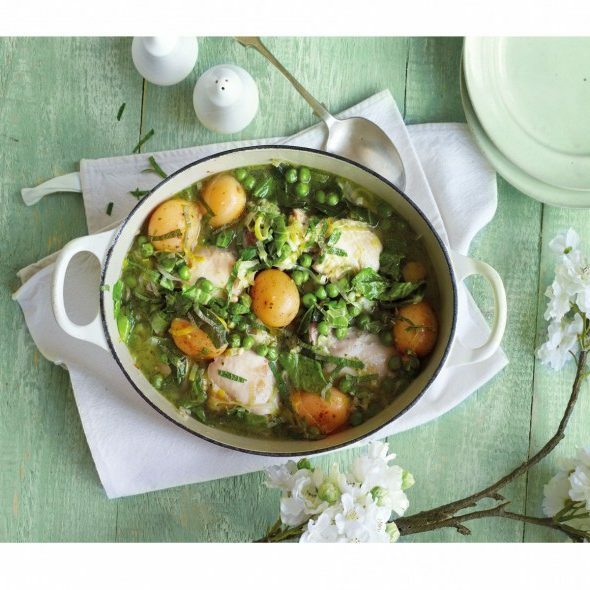 This lovely spring chicken casserole is really simple but so delicious. We found the recipe in Good Housekeeping and think it is super fresh and with all the flavours of Spring! Perfect for this time of the year when the weather isn’t sure what to do with itself! In a large hob-proof casserole dish, heat 1tbsp of the oil and gently sauté the leek for 5min. Add the rest of the oil and the chicken thighs and brown on all sides for 6-8min. Stir in the flour and cook for 1min before adding the white wine, then bubble for 5min. Add the chicken stock and new potatoes, cover, bring to a simmer, and gently simmer the casserole for 25min. Add the spring greens and simmer for 3min before stirring in the peas and pesto. Season and garnish with the mint leaves.